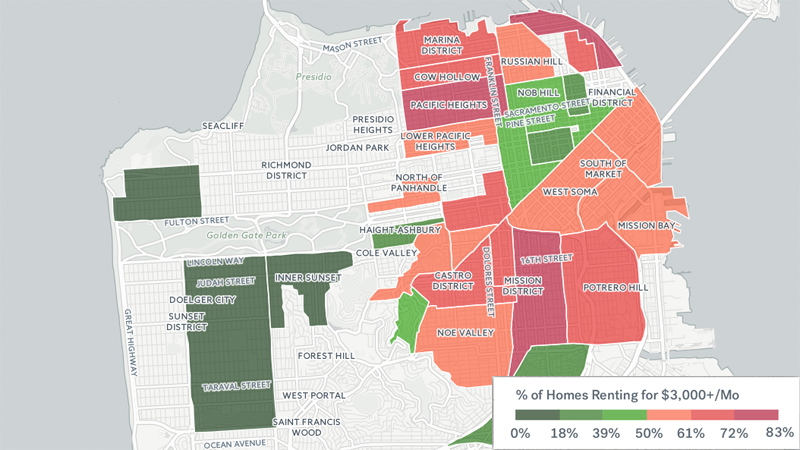 It's been a while since we've posted a depressing map about how bad the Bay Area rental market has gotten. You might remember the one that charted where you could find an affordable one-bedroom along BART (spoiler: basically nowhere). There was also the one about San Francisco, Oakland and San Jose being the top 3 worst cities for renters. Not to be outdone by the report that said you'll never own a home in the Bay Area. And now we can add another depressing map to the mix. Trulia, a real estate listing service, crunched some numbers and put all their upsetting findings into a fun interactive map. San Francisco, not surprisingly, is right at the top of the list of U.S. cities with horrifyingly high rent prices. According to Trulia, the median rent for a 1-bedroom in SF is $3,200 and the most expensive neighborhood to live is Fisherman’s Wharf (there's no accounting for taste).